Orchids need humidity and the winter time is about the worst time to try to keep it up. It just seems to fall out of the air once it gets inside. The relative humidity outside is at a nice 73% but it's at a temperature of 54°. Once it gets inside that drops to 42% at a livable temperature of 72°. Placing these wet containers with paper towels to wick up the water into the air have helped the humidity come back up to about 57% so far. Not ideal but a lot better for these tropical humidity loving plants. I might just have to add some more of these guys to further boost the moisture so these guys can thrive. Although not a really significant source of nitrogen beans can still help other plants to grow and hopefully make some tasty beans in the process. A study by Roger Luiz Da Silva Almeida et. al. published in March 4, 2012 in the Iranica Journal of Energy & Environment concluded "The nitrogen level used in this study positively influenced the plant growth." So, it can't hurt. The seeds planted were about 4 years old and every one of them sprouted. I guess I kept them well. They've been in the fridge in sealed plastic bags the entire time (except when we were moving). Next week there's supposed to be a nice warm day or two that I can use to put these guys outside for a bit of fresh sun. February isn't going to be too high in the sky so I'm not too worried about scorching the leaves. The beans really do prefer a bit of sun though and would be good for them. To be sure I've also got plant food for them, you can't rely entirely on beans you know. 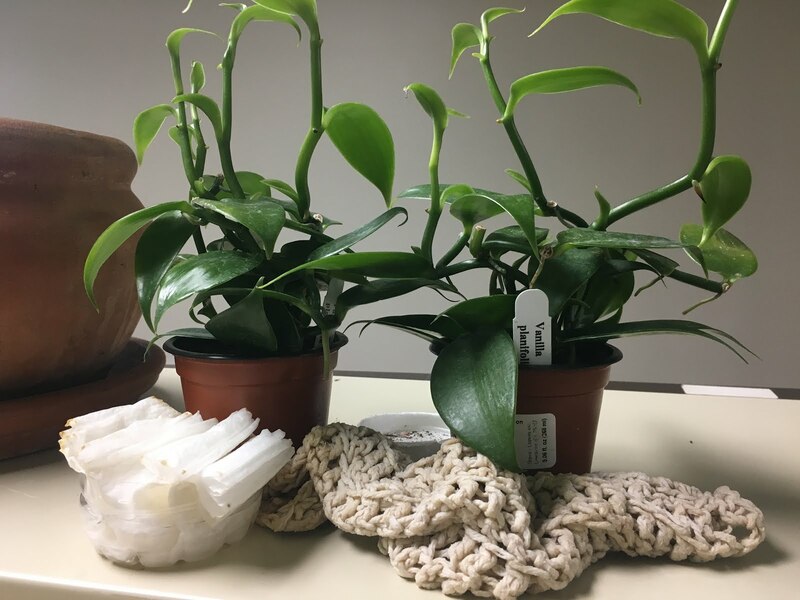 Vanilla orchids are tropical climbing orchids that can reach such lengths that you would probably cut it back before it reached its full potential. Some say 80 feet while others claim hundreds of feet in length in its native habitat. While typically considered a Mexican native, the USDA also shows it to be a Florida native. Other sites say it has also been found to grow in Texas and California, of course only in areas of high humidity and mild climates. Shown here are my two vanilla plants, recently acquired from a nursery out of Lewisville, Texas, Steve's Leaves. As you can see I have placed some items that are releasing water into the air to keep them happy. The one on the left is a cut out water bottle bottom with paper towel bits layered to stand up a it and water poured in. The other is a cotton crochet cloth. The many holes and twists give it plenty of surface area to evaporate water from. So far we're on week 2 and they seem healthy enough. During the week I place them in a box lined with plastic overnight to give them a nice humidity bath. So far so good. They've already grown about three inches since they arrived. I plan to find a cheap misting bottle soon so I can mist them in the mornings and early evening. So far I haven't gotten them any plant food but I should look into that. As far as water, I've been using Ozarka natural spring water. I don't want all the chemicals from the tap water on the plants. The future plans for these guys is to set up an area where they will get enough humidity and light that they can really thrive. Of course it would be great in time to be able to make my own chocolate from the cacao trees and vanilla plants, but that's still a ways off.